I was short of a set of handlebar clamps for the ’28 bull nose Model 90 that we are working on and so had a few sets cast and machined-up using an original Marston clamp from the ’30 bike as a pattern. They came out quite nicely in high-tensile brass and will be serving in place of decorations over the Christmas period. 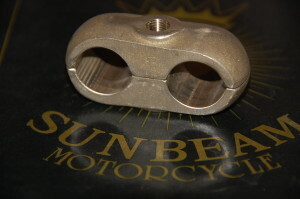 Handlebar clamps for Sunbeam motorcycles with Druid rather than the later Webb-type forks. I had a few extra sets produced and will put them on the shop in due course in case anyone out there is also in need of a set. This entry was posted in Shop and tagged for sale, Model 80, Model 9, Model 90, spares, Sunbeam by Dodson. Bookmark the permalink.